When I looked up this film I was surprised to see who it starred. Oh, I thought, a Griffith movie with W.C. Fields! Not long into viewing, I realized that the reverse was probably true: this was a W.C. Fields movie that happened to be directed by D.W. Griffith. Now I don't really think this is the case - Sally was Fields' debut so it's hard to say there was any such thing as a Fields movie at this point - and I would hardly be the one to determine such a thing. A shameful admission: until now, I'd never seen a W.C. Fields movie. That sordid detail aside, this is not exactly typical Griffith. True, it is sentimental and melodramatic (though also by and large a comedy), with some subpar Victorian plot developments, and what J. Hoberman astutely calls Griffith's "opposition to Americans even more puritanical than he." But its flavor is largely determined by Fields' brusque, buffoonish, yet charming rogue, a carnival con man who has adopted young Sally (Caroline Dempster) and is now taking her to the town where her rich grandparents - whom she's never met - reside. There are gags (most disturbingly when Fields gets locked inside a wood stove), mugging aplenty, and even an extended chase sequence which at times bares a closer resemblance to Keystone than Biograph. But Griffith's fingerprints haven't been entirely lifted from the material. You can still sense his touch in intimate passages, like the early sequences featuring Sally's family before she was born and a later romance between Sally and a local boy. It's ironic that for all Griffith's contributions to the development of film language, it is his way with actors that is perhaps his most distinctive virtue once he falls behind the times in technical accomplishment. Still, the performances here - outside of the moments where Griffith is able to sneak in some small-town poetry - are seldom convincing, and without Fields the movie might well be insufferable. Some have noted that the final chase goes on too long, and indeed the film itself is long-winded: at an hour and fifty minutes it could afford to lose a half-hour or more. The best moments are in the beginning, as we travel with the circus duo, and watch them arrive in Sally's (unbeknownst to her) hometown where they are given time to wander around, outsiders momentarily immersed in a land of comfort and plenty, but only as outsiders. Sally visits a cemetery in a lovely moment, and we are reminded that a master, however diluted in his talent and outdated in his sensibility, is at the helm. A pictorial grace lingers in Griffith's work, doing its best to balance out the maudlin (and increasingly anachronistic) intertitles which even contemporary critics had fun ribbing. 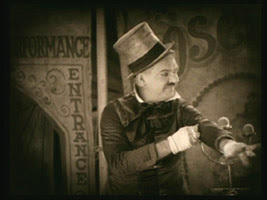 Robert Sherwood lampooned Griffith's sentiments back in 1925, and also wrote, "It is the work of a man who has become so completely soaked with theatrical trumpery that he wouldn't recognize reality if it stepped up and slapped his face." Some great directors adapt with time, others stubbornly stick to their guns and maintain a sort of idiosyncratic truth, while some fade away with half-measures and lame attempts at former glory. Sadly, we seem to be approaching that point in Griffith's career where he begins to cut a vaguely pathetic figure. And yet the film is not a disgrace, though it ultimately appears to be a failure and, in large chunks, a mediocrity. It shines here and there, especially in the first half, is marked by an engaging persona in Fields and an ever-sensitive mind in Griffith, and rises above its material on occasion. Dempster, who has been criticized here and in America, is also game. Though occasionally obnoxious, she is not undistinguished and, in the course of her performance she crafts a distinctive personality (do with it what you will). And I'll say this: though I found much of Sally tedious, when the heroine is reunited with her grandparents at film's end and Fields sneaks out of the courtroom (don't ask), I felt genuine sympathy for his character. What's more, Griffith is smart enough not to overtip his hands (when all is said and done, mawkishness tends to characterize his flowerly titles more than his mise en scene). We cut from a medium shot of the newfound family embracing to a distanced exterior: Fields' back is to us as he ambles down the dirt path, away from this comfortable little hamlet and the only family he's known. It doesn't end there, but this moment serves as a reminder that whatever his flaws and embarrassing floridity, Griffith maintains a certain sincerity. An ability to make you care about one's characters is ultimately nothing to write off and here at least, Griffith upholds his dignity. A nuanced and sympathetic review MM. I have just been reading about Griffith in a short bio by film writer Richard Armstrong in The Rough Guide to Film, and I was intrigued by this line: "His later works... lacked the innovations of early features, although Isn't Life Wonderful? (1924) arguably foresaw Italian neo-realism". Do you plan to review this one - I would be very interested in your take - as over here I don't have access to such titles. Tony, I wish I could - but it's not on Netflix (which is what I've been basing this Griffith series on). If that changes, or else I find a copy, I will definitely write it up and insert it as best I can into the series pantheon (via "previous" and "next" links, not creative dating). Good timing, by the way, as I am wrapping up my look at Griffith this weekend, with another review up a few minutes after I post this comment, and possibly a couple more tomorrow - including his sound film Abraham Lincoln which I haven't watched yet but am very intrigued by. Thanks for the great link - I'm thrilled to see that The Struggle, seemingly without fanfare (usually these things build with critical appraisals, retrospective screenings, the whole cinephile PR machine wheels set in motion) is receiving impressed reevaluations across the board. As for Isn't Life Wonderful? it looks like unfortunately the author mentions it on a hopeful note - suggesting that it be included in the NEXT boxset. Let's hope his suggestion is heeded!